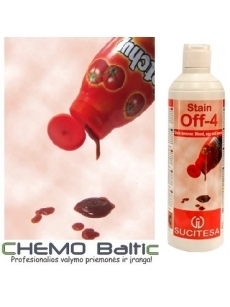 Facilitates the removal of stubborn protein-based stains such as blood, egg, sauces and similar. Facilitates the removal of stubborn protein-based stains such as blood, egg, sauces and similar. Excellent results without damaging the clothes. Professional laundry, hospital and OPL's. in a non visible area. Do not let the product dry on the textile.